HORUS16 system assumes 16 video channels transmission for each wavelength, different options associate data and IP 10/100 Mb channel on the same optical fiber. 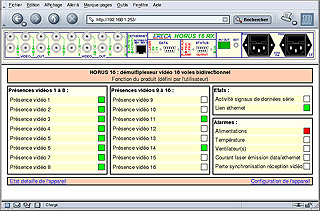 HORUS16 equipment is capable to work in bi-directional mode on only one fiber. Digital transmission technology at 3 Gigabits/s is the warranty of a real time transport of the signal, without compression and a signal to noise better than 67 dB. Two redundant hot-swappable power supplies allow the use of two energy sourcing. 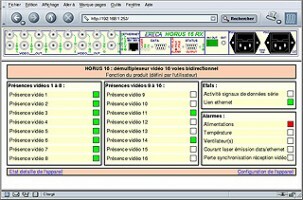 CWDM technique used with HORUS16 allows real time transmission of 128 video channels on only one fiber. HORUS16 are equipped of alarm controller that can be supervised through Ethernet network. This consultation is done using a browser giving the display of HTML pages. As an option the control can be done with an integrated SNMP V1 agent. HORUS 16 has been designed to offer the most reduce size , its 19’’ 1U chassis can integrate in rack without cooling space.